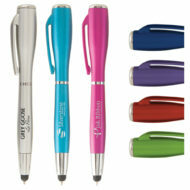 Promotional pens with Stylus are an inexpensive yet effective way to advertise your business, organization or cause. 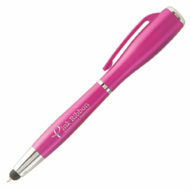 Personalized stylus pens is just what you need to ensure your logo is seen everywhere. We offer custom imprinted stylus pens at the lowest price, and have a wide selection of customizable promotional pens to showcase your brand! Logo imprinted stylus pens are a perfect giveaway for trade show, every day marketing, meetings, new client gifts, and more. To make a lasting impression for your brand or business, we offer free setups and free shipping on many of our logo writing instruments. For the best source to order top quality promotional pens, shop our selection of stylus pens with fast production and low minimum order requirements! Make sure your company lights up the room when you come in with the custom printed Nova Touch LED Light Metallic Stylus Pen! 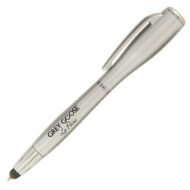 This multi-function pen features a touch stylus at the tip and a button activated LED flashlight at the top. Black ink comes with the medium ballpoint pen, perfect for signing contracts, taking down contact information or making notes at a seminar. A promotional pen with multiple functions is the perfect marketing tool for your company! Order today!